Traveling fronts and stationary localized patterns in bistable reaction-diffusion systems have been broadly studied for classical continuous media and regular lattices. Analogs of such non-equilibrium patterns are also possible in networks. Here, we consider traveling and stationary patterns in bistable one-component systems on hierarchical tree networks. As revealed through numerical simulations, traveling fronts exist in network-organized systems. They represent waves of transition from one stable state into another, spreading over the entire network. The fronts can furthermore be pinned, thus forming stationary structures. While pinning of fronts has previously been considered for chains of diffusive coupled bistable elements, the network architecture brings about significant differences. An important role is played by the degree of a node. For regular trees with a fixed branching factor, the pinning conditions are analytically determined. where $u$ is the local activator density, function $f(u,h)=u(h-u)(u-a)$ specifies local bistable dynamics and $D$ is the diffusion coefficient. Depending on the particular context, the activator variable $u$ may represent concentration of a chemical reagent or of biological species which amplifies its own production. 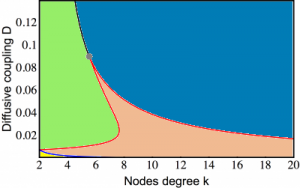 In the figure below we see a regular tree with the branching factor $k-1$, where $k$ is the nodes degree. This latter equation can be analysed (see ) and reveal all the dynamics of the bistable trees which support propagation, stationary and retreated fronts. a. Green region: The activation propagates towards the root and the periphery. b. Brown region: The activation propagates towards the root but not to the periphery. c. Yellow region: The activation is pinned. d. Blue region: The activation propagates towards the root, but it is retreated from the periphery. Based on the theory for the regular trees we can predict the behaviour of an activation set on a node or on a group of nodes in a non-regular tree. The video below shows that the activation can propagate through some nodes but gets pinned in front of other nodes, a behaviour that depends on the degree of those nodes. PLoS ONE 7(9): e45029 (2012). EPL (Europhysics Letters) 102, 16003 (2013).